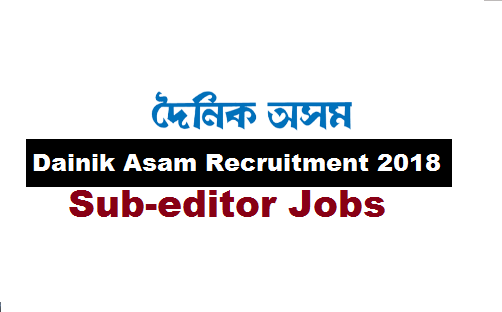 Dainik Asam , one of the leading news papers of Assam has recently issued a vacancy notification 2018 for filling up Sub editor post. Applications are invited to fill the following vacancy at Dainik Assam. Following are the details of the post under Dainik Asam Recruitment 2018. Educational Qualification : The candidate should be graduate in Arts, Science or Commerce, and have previous experience of minimum 5 years in an established Assamese daily Newspaper. A good knowledge of computer and ability to translate from English to Assamese are essential. Age Limit : The applicant should be below 35 years. Other Skills : Besides Assamese the candidate should preferably have good command over English. Emoluments and perks as per Wage Board recommendations will be offered. M. R. D. Road, Chandmari, Guwahati —781 003.